Samuel Dylan Rosner. Photo courtesy of Avery Peck. Samuel Dylan Rosner, a young man from Scars­dale, New York, is a talented musi­cian with a singular passion for Jewish music. 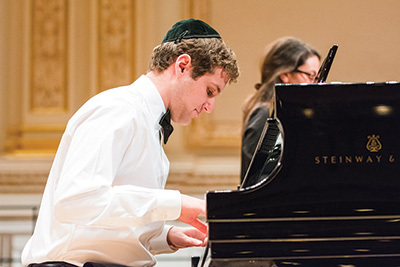 In April, Rosner’s original mu­­sic was performed at Car­negie Hall in New York by Ha­­Za­­mir: The Inter­na­tional Jewish High School Choir—making him the youngest composer to have his work performed by the group. The 17-year-old, a high school senior at the time, accompanied the choir at the piano as they sang his setting of Psalm 96. According to Matthew La­zar, HaZamir founder and director of the Zamir Choral Foun­da­tion, Rosner’s composition was the first piece the youth choir has ever performed that was written by one of its singers. Rosner’s musical talent be­­came apparent at a young age; at 9, he performed a solo in Sergei Prokofiev’s “War and Peace” at New York’s Metropolitan Opera. As a high school student, he spent his Saturdays studying at the Juilliard School’s Pre-College Division. Now he is a freshman at Harvard University.